Be the first to say "I Love You." 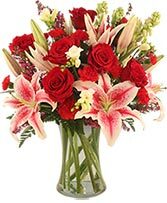 Surprise your sweetheart by sending them a Glamorous Bouquet of Stargazer lilies, red roses, red mini carnations, white freesia and white tuberoses. 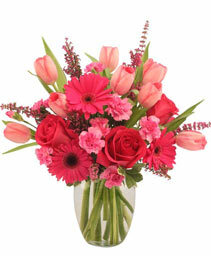 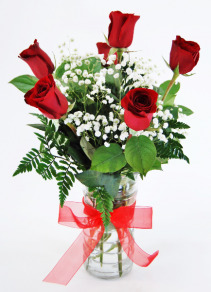 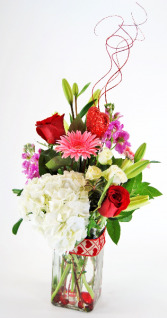 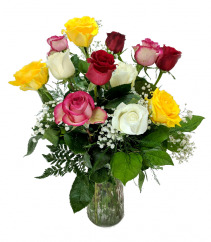 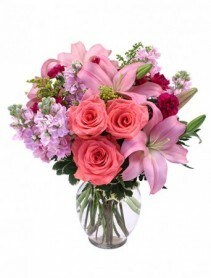 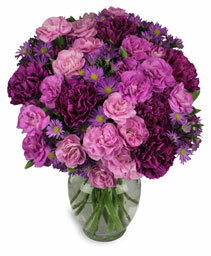 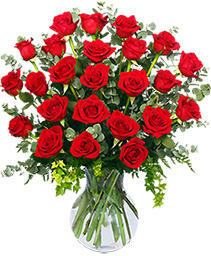 Order flowers online day or night or call DRUMMERS GARDEN CENTER & FLORAL to send flowers to the one you love the most. 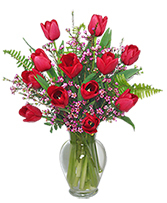 Surprise your love with elegance and passion! 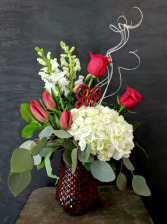 With soft white hydrangeas and snapdragons, deep red roses and tulips this arrangement will surely show them your passion...just for them! 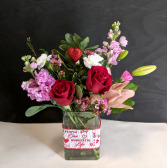 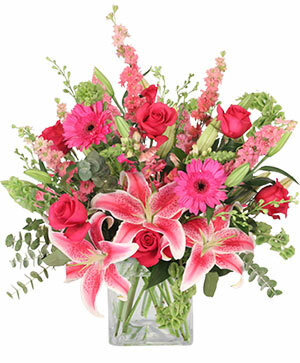 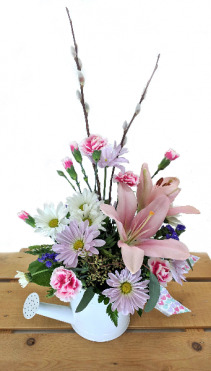 Tell them they are a wonderful part of your life with this arrangement made with pink asiatic lilies, fragrant purple stock, mini white carnations and an accent of a red roses and sparkling decorative heart to let your love know they are wonderful. 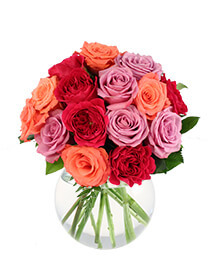 Go classic but with a colorful flair with our half-dozen mixed color roses. 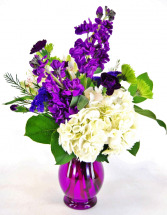 Treat your love like royalty this Valentine's Day with billowing white hydrangeas, towering purple stock, green athos, and mini purple carnations in a purple vase. 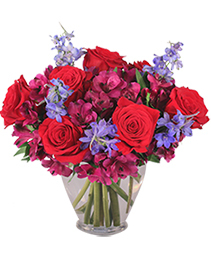 Leave your love smoldering on your anniversary or Valentine’s Day with red roses, deep burgundy alstroemeria and the bright blue of delphinium. 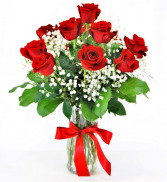 They know you love them, now let them know it’s forever. This colorful arrangement will bring your sweetheart joy with its irises, daisies, mini-carnations, and a sparkly heart accent. 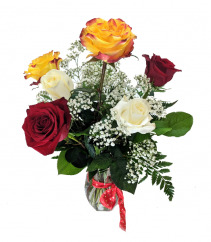 We stock a variety of fine Abdallah Chocolates in a wide range of package sizes. We have one just for you! 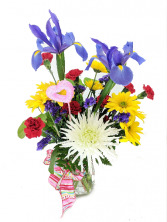 It's easy to add a plush item to your order. 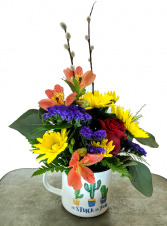 Just click the price you want to spend when we ask you for add-ons. 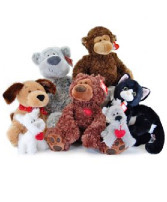 Let us know if a traditional bear will do or maybe we have their favorite animal? 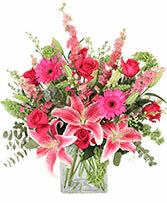 Call us if you want pricing on any item.